Code: PNII-RU-TE-2012-3-0477. Number of financial contract: 51/30.04.2013. Funded by: Romanian National Authority for Scientific Research, Executive Unit for Financing Higher Education, Research, Development and Innovation (UEFISCDI). Contractor: „1 December 1918” University of Alba Iulia. Project duration: 41 months. 2013-30.09.2016. Principal Investigator: Ileana Burnichioiu, PhD: CV-RO, CV-EN). Contact: monastic.life2014@gmail.com, ileanaburnichioiu@yahoo.com. In the process of the Christianization of the Hungarian Kingdom and of Eastern-Central Europe, the rise of monasticism was one of the most significant developments. Part of this phenomenon took place in the eleventh and twelfth centuries in the Mureș-Tisa region. In this area, along an important salt route heading from Transylvania towards the West, North, and South through the Kingdom of Hungary, more than thirty monastic foundations emerged. Supposedly, these foundations were either Benedictine or of Greek rite. However, many of them are still controversial in this respect, since their rite or order, hierarchical subordination, mission, and patrons are not mentioned in the written records. Some of these, named only in passing in the edited written sources, are still unidentified in the field. Their material remains have vanished, some of them originating as early as the thirteenth century. Consequently, gathering information and sources, as well as finding answers to the research questions raised in monastic studies depends very much on the progress of archaeology and the association of its results with those of other disciplines. This also entails the thorough publication of all the archaeological data at hand, jointly analyzed with the re-evaluated written evidence. An expansion of this kind of knowledge and a new interrogation of the sources in an adequate, up-to-date approach to monastic history is now possible in the case of the seemingly vanished Benedictine monastery in Bizere. This monastery certainly belonged to the Benedictines; it was an abbey and functioned, with numerous disruptions, from at least the twelfth century and until the sixteenth. Parts of its early history are unknown, such as the exact date of its foundation, the provenance of the monks that came to populate it, which were the first buildings erected, and the area occupied by the complex. Between 1183 and 1522, there are approximately 40 documentary mentions of this monastery. It was probably completely abandoned during the time of the Ottoman invasion of Banat (1520-1530) and gradually fell into ruin, losing its status. 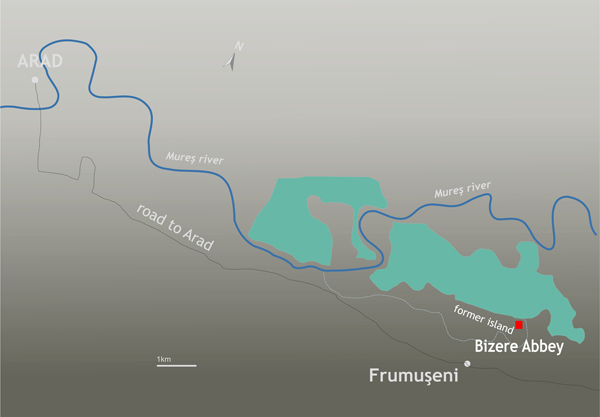 During the nineteenth century, scholars began to make attempts at locating the monastery, but the resolution that it was placed 15 km away from Arad, towards Lipova, on an island of the River Mureş came later, in the twentieth century. After a number of prospections and confusions had entered the literature, in 1981 the first archaeological survey (led by Mircea Rusu from the Institute of History in Cluj-Napoca) at the site showed that its precise location could be determined. Excavations started again in 2001 and, during nine consecutive campaigns, parts of the building foundations that belonged to the monastery were uncovered: significant remains of the rectangular cloister with a refectory and ground floor traces of two Romanesque churches (an abbatial church and a chapel), a palace, and a water tower were all identified, along with other buildings with yet unknown functions. Within the main church foundation (a three-naved basilica) two decorated surfaces of polychrome pavement mosaics were found in situ (measuring 4.50 x 1.50 and 1.60 x 1.50 meters, respectively), together with a few hundred various isolated pieces of floor mosaic. Furthermore, the archaeological excavations brought to light hundreds of sculptures and carved fragments of miscellaneous stones (now hosted by the Arad Museum Complex, Arad County), as well as different categories of artifacts. This research has been predominately financed annually by the local county council, which hoped to develop a touristic area at the site of the monastery and its surroundings and even include it in a durable development project. However, in 2009, due to lack of funding, the research was stopped. The documentation and publication of the rich material unearthed during these nine campaigns were interrupted before the reconstruction of a coherent plan of the monastic complex, the determination of the functions of all the researched buildings, or the gathering of all the relevant data from the field for an adequate contextualized publication of the material culture could be completed. This is why the archaeological team could only publish brief archaeological reports, a short monograph of the pavement mosaics (Burnichioiu, Rusu 2006) and a first volume of studies (Mănăstirea Bizere, I, 2011) strictly limited to some of the architectural components and installations which benefited from complete datasets: the water tower, the funerary chapel, a bread oven, and the boat imprint. In the same volume, first hand documents regarding the monastery were presented, together with the first analyses of building materials. The preparation of these long-awaited publications has clearly shown the need to restart and supplement through new research the data retrieved in 1981 and between 2001-2009. Thus, it requires an ample interdisciplinary project involving a larger team of specialists, according to a long-term, well-defined research plan. Moreover, the data recovery and the study of the physical remains left by those populating the monastery and the island (architecture, artifacts, earthworks), as well as their conservation, will allow the construction of a nuanced and more comprehensive picture of the major chapters pertaining to the life of this community. These refer to monastic life, art, and technology, dimensions illustrating the ways in which the monks furnished their built spaces on this eastern border of the Benedictine world. An interdisciplinary approach is also needed in the light of the present state of research in this field. The numerous questions posed by this project to the available sources were inspired by the programs and workshops organized by the Central European University, Budapest – Department of Medieval Studies (e. g. “Monastic Landscape: Spiritual and Physical,” 2009; “Medieval Monastic Regions in Central Europe: The Spiritual and Physical Landscape Setting of Monastic Orders and Religious Houses,” 2009-2010, in co-operation with the Centre for Medieval and Renaissance Studies, Göttingen) and by “Conventus: Problems of religious communal life in the high Middle Ages,” a Scientific Research Network of the Research Foundation-Flanders (Belgium), led by specialists from the universities of Ghent, Leuven, Brussels, Lille, Strasbourg, Tilburg, and Indiana. 1) The main objective of the project is to restore the ground plan of the monastic complex and to establish the relationship between the built complex and its placement—a former island of the Mureş River, 15 km away from the town of Arad. Other major objectives include determining the connections between the monastic complex and its medieval namesake village, which disappeared during the sixteenth century, as well as to identify the possible remains or traces of annexes that belonged to the monastery and were located on the former territory of its possessions. This objective is central to the project and especially important both in general, as well as for the study of its various particular aspects, given the fact that previous funding did not allow an interdisciplinary approach to this particular objective. 2) Documenting the data collected in the field and recording and cataloguing the earlier data and materials stored in the collections of the Arad Museum (retrieved by previous excavations, in 1981 and 2001-2009) also constitutes one of the goals of this project. This would enable straightforward access for future studies and allow other researchers to handle data with ease. For the same purpose, a digital database will be created. This second objective sets the framework for the analysis and publication of artifacts, which is essential to comparative studies on different topics (from monastic studies to medieval life). The documentation and compilation of the artifact database will be done according to a chart. This work will consist of filling in computer data forms for each artifact, while recording a visual description, the location within the archaeological site, its dimensions, original technique in different formats, dating, style, artifact ID, pre-existing documentation (past study, excavation reports, old photographs, drawings, other references etc. ), graphic and photographic documentation. - How old is the establishment of the monastic site? What was the primary planimetric configuration? When was it built and in what form? What was the spatial organization of the complex? - What were the economic and technological means that facilitated the foundation of the monastery, sustained its existence throughout the centuries, and the everyday life of the monastic community inside the convent? What were the artifacts used in everyday life in a monastic environment? How did monastic life function between norm and practice? What relationship did the monastery have with the “outside world,” central and local lay authorities, the papal seat, the bishopric from Csanád (Cenad), the provostship of Arad, its villages, with the nobility that possessed land in the monastery’s vicinity and others? Can the patrons—unaccounted for in written sources—be identified through other means among those who were connected to the monastery? - What was the decorative heritage of the monastery’s different spaces? What form and what meaning did these have? Can parts of a visual message be reconstructed based on the contents of the mosaics and the sculpted fragments from Bizere? From where did the masters come from? With what means and materials did they work on the island? What was the provenance of the building materials? 4) Through workshops and conferences we plan to discuss the above mentioned questions (at point 3) in a wider context and, eventually, disseminate our answers based on the interpretation of the data acquired by fulfilling the first two objectives. This goal will be attained with the cooperation of external partners (from Central European University in Budapest—Department of Medieval Studies and Department of Geophysics and Space Science, Institute of Geography and Earth Sciences Eötvös Loránd University in Budapest). This collaboration is designed to produce and disseminate individual results through articles published in journals and papers presented at conferences which are connected to the subjects of the project: monastic studies, Romanesque art, medieval technology, medieval archaeology, and landscape archaeology. One of these scientific gatherings will be the project conference and exhibition planned for the autumn of 2014 in Alba Iulia (International Conference, October 16-18, Monastic Life, Art and Technology in 11th-16th centuries).The final aim resides in producing the major one-volume study of the Monastic Life, Art and Technology at the Bizere Monastery (2015). 5) The last goal is the establishment of a research database at the host institution (“1 Decembrie 1918” University of Alba Iulia, Department of History, Archaeology and Museology), which will be made available for specialized departments of the host institution and the Central European University, Visual Lab at the Department of Medieval Studies, as well as for the Museum of Arad. This approach is new to Romanian historiography as it seeks to integrate the topic in the wider European research milieu. In the process, the archaeological sources stored by the local museum will finally become better known and more accessible to specialists and students worldwide. It will hopefully facilitate future collaboration with specialists from both Central-Eastern Europe and Western countries working in the fields of monasticism, art history, and medieval technology. At the same time, it will offer a new example of analyzing a significant quantity of material culture in the context of a monastic complex, provided by old (from 1981 and 2001-2009) and new archaeological research (2013-2015). These new investigations include, for the first time in Romania, a monastic landscape approach that will open new bases for comparisons with other European areas. 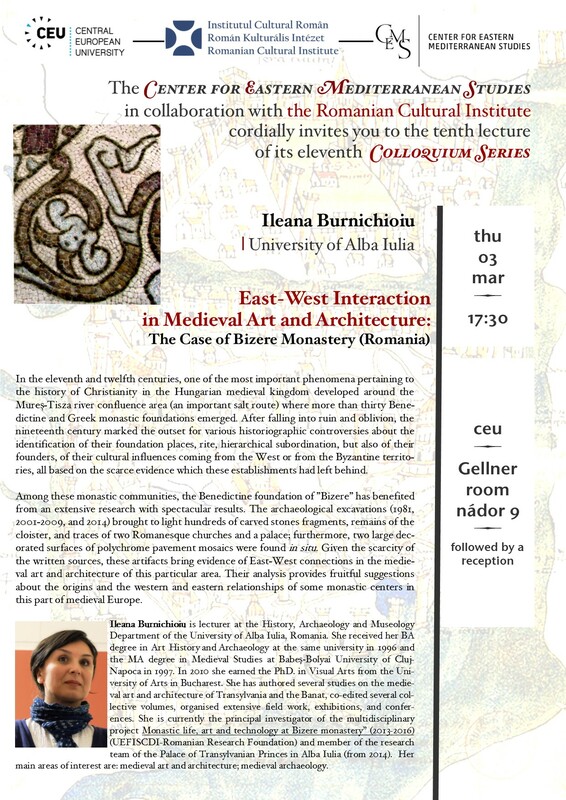 The project will also contribute to a better terminological use in medieval and visual art studies in Romania and will start off new lines of research. The project aims to serve a didactic component as well. Students (PhDs, together with undergraduates and MA students) will be involved in the documentation and analysis of the data, experiencing archaeological excavation and non-destructive research methods. At the same time, we plan to create a basis for a Visual Lab and a database of the significant research resources and make it available for the specialized departments of the host institution (“1 Decembrie 1918” University of Alba Iulia, Department of History, Archaeology and Museology) and the Central European University, Visual Lab of the Department of Medieval Studies, as well as for the Arad Museum. Through the collected and disseminated data, using different methods and means, the project will offer an essential dataset for a future conservation plan of certain categories of material culture and for a project essential for the protection of the mosaic pavement found in situ, followed by prospective museum development. Moreover, it will serve the intentions already expressed in the years 2003-2009 by the County Council (the main financial supporter of the archaeological research between 2001-2009, together with the Arad Museum), to conceive a conservation project for the Bizere site as part of a wider development plan. While aiming for the completion of the main objectives listed above (the ground plan of the monastic complex, the relationship between its built components and their functions, the relationship between objects and space usage, as well as the connection of the monastic complex to the nearby medieval village), the project will employ the newest multidisciplinary approaches and research methods in the fields of environmental history, landscape archaeology, architectural history, and rural topography. The spatial and landscape analysis of the monastic complex will draw on the results of a variety of primary sources, which can provide a better understanding of the use of space within and outside the monastery. For this study, the methodology developed by landscape archaeology will be utilized, that is the close reading of the written evidence, field work, topographic measurements, and the use of historical maps for identifying vanished features on the land surface, which can likely still be identified in the field and used in the interpretation process. The main source of information will obviously be the monastery and its surrounding landscape. Field work, aerial photography, and geomagnetic survey will greatly contribute to the process of landscape reconstruction and to understanding how this past landscape was used by the monks and other people. Analytical laboratories (physical anthropology, archaeozoology, paleo-metallurgy, petrographic analysis, and so on) will be called for when needed.